Good afternoon. I would like to thank Professor Rosalind H. Williams and her colleagues in the Program in Science, Technology, and Society for the invitation to deliver this year’s Miller Lecture. It is a great privilege to be with you on this occasion. This afternoon, I would like to talk about some large issues that affect all of us in this university community. It is all too easy for us to lose sight of these overarching concerns in the press of everyday activities on a very busy campus. I would like to use this occasion as an opportunity to think about why we are here, what goals we share, and how we can best achieve them. Before I begin a discussion of the larger issues and of our foundational principles, I would like to address very briefly two cases that have received some attention recently. I do not want to dwell on their particulars today, but in the context of this lecture we must acknowledge them. Both took form before I joined the Institute last December, so I have inherited them and their histories. Each illustrates an important case lesson for our community. I will speak at some length later about the absolute necessity of trust and shared standards of integrity in all we do, which is an understanding that lies at the heart of our work. Departures from this understanding must be treated with the greatest seriousness. Another key element in considering both cases is how MIT’s adherence to a system of faculty governance has allowed us to develop, over the years, a remarkable process for the investigation of allegations of research misconduct. The process demands confidentiality – most importantly to protect those who may be entirely innocent, but also to allow the work of the faculty conducting a review to proceed as they determine is necessary. So I cannot speak in detail about the cases themselves, but will give only a brief description. The first instance has to with a review, conducted by the Department of Defense, of work done at another organization. The five-member reviewing group appointed at the request of an agency of the Defense Department included two staff scientists from the MIT Lincoln Laboratory and three individuals not affiliated with MIT. The allegations concern the work of this reviewing group. Complications in resolving this case have been a source of frustration to all of us, but I want to reassure you that we are pursuing its resolution by working on two paths. First, in close consultation with a faculty committee, we continue efforts at the highest levels of government to determine how an investigation of the allegations will take place. At the same time, the Provost has appointed an ad hoc committee to review the lessons we can learn from the case. This is not an investigation of the charges themselves, but an assessment of the process. It is our responsibility to continually review and renew our processes, to be sure that they can assure our faculty, and our whole community, of our adherence to the highest standards of research conduct. I am grateful to the respected colleagues who have agreed to take on this responsibility. In a second recent case, the Institute has dismissed a member of the faculty who has admitted fabricating and falsifying data in manuscripts and grant applications. This is a tragic case, as are all departures from our shared standards of conduct. But this case has demonstrated how our process can and should work in situations such as this. We can take some measure of pride that the fabric of our community permitted colleagues to come forward with their concerns about the work in question. There followed an extraordinarily careful and thoughtful investigation by members of our faculty. The whole process has obviously been very difficult for all concerned. But I believe it shows the fundamental strength of the system of faculty governance on which this Institute relies. I want to underscore the necessity of ongoing evaluation of our processes to make sure they meet our own highest expectations of ourselves. It is clear that the system can work effectively in even the most difficult cases. But to make sure that it always does so requires constant tending of our environment and constant willingness to review and revise our processes. We must fulfill our responsibilities to each other if we are to fulfill our responsibilities to the world. Let me turn now to the larger issues of today’s talk. I will talk about how the history of the university sets the stage for MIT today; how integrity, independence, and engagement with the world are key to fulfilling our mission; and how we discharge our responsibilities through education, innovation, and the power of example. MIT, like all contemporary universities, inherits an historic tradition going back at least to the late Middle Ages. I will come back in a minute to some of the defining features of the early universities, and how they continue to be relevant. But for us, one great transformation in the history of universities was of key significance – the emergence of the research university in the 19th century, first in Germany and then in this country. We cannot overestimate the importance of this development. Until that time, the university had been seen primarily as a guardian and teacher of existing knowledge. Since then, how and where research is pursued has become a defining difference between the standard European model and the American model, which has proved so successful. In an 1854 essay on The Idea of the University, John Henry Newman produced a compelling defense of the university, as it had long been understood. Newman described the university as meeting a natural human hunger for knowledge, and he articulated the central importance of education at an advanced level. In doing so, he defended many of the principles that lie at the core of colleges and universities today, including the pursuit of knowledge for its own sake, which laid a philosophical foundation for fundamental, curiosity-driven research. However, the American research university departs from Newman’s concept in a critical way – one that has led not only to its success, but has also fueled this nation’s innovation economy. Newman did not view universities as the proper place for research; instead, he recommended a “division of intellectual activity between Academies [for research] and Universities [for teaching].” In fact, he wrote, “To discover and to teach are distinct functions; they are also distinct gifts, and are not commonly found in the same person.” And further: “If its object were scientific and philosophical discovery, I do not see why a university should have students.” On these points, I would challenge him with the evidence of MIT today. The fundamental idea behind the research university turns Newman’s contention on its head, in the belief that research and education are mutually reinforcing. Today, the fusion of teaching and research is best exemplified in American universities, and perhaps nowhere more fully than here at MIT – where virtually all of our faculty, each of whom engages in world-class research, have a presence in both the classroom and the laboratory, and where 85 percent of our undergraduates engage in research through UROP, the Undergraduate Research Opportunities Program. As a research university, we have two overarching responsibilities to the nation and humanity. The first of these is to educate our students to be the leaders of the next generation. This requires the unfettered transmission of knowledge through educational activities. The second of our overarching responsibilities is to advance knowledge in ways that will serve humankind. We do this through research and other scholarly activities. There are some critical enabling factors if we are to undertake both of these great tasks successfully. For now, I would like to focus on just three – integrity, independence, and engagement with the world. Integrity is an essential aspect of both research and education. The kind of work we do requires a community of shared values and standards, because both scholarly work and teaching are predicated on trust. Why is this? First, with respect to advancing knowledge: Researchers must be able to rely on the work of colleagues. The process is akin to that of surveying uncharted geographic territory. In fact, in our work we do chart as-yet-unexplored territory of the intellect and of our physical universe. The work is necessarily cumulative. Researchers must be able to rely on and build upon previous work. If not, they will quickly find themselves in a wilderness without bearings. And, with respect to education: Students must be able to trust and respect their teachers. Junior colleagues must be able to trust and respect senior mentors. Students and faculty alike must be able to trust and respect their peers – trust that the information and ideas advanced are as reliable as possible. These goals are never a finished product, and always a work in progress. As we explore the unknown, as we search for words to describe new ideas and phenomena of nature, there will be errors, there will be mistaken directions, and there will be inaccurate depictions. We must always be conscious of the inherent imperfection in the difficult task of discerning the new and unexplored. However, we must agree, as a community, to do the best we can to do the work of the university with the highest degree of integrity. The world relies on us to do so, and if we do not, we forego the ability to carry out our work, and we lose the public trust. One of our educational responsibilities is teaching those in our community about our standards. The new student handbook on academic integrity at MIT, recently issued by Dean Redwine’s office, is an excellent instance of one way we can do this. MIT is an institution of high moral standards. I believe we share a profound commitment to the truth, and to doing what is right. And the conduct of our faculty, students, and staff generally reflects that commitment. But in any community, there will be departures from the standards or assumed norms of conduct. And MIT is no exception. Our processes for dealing with such departures are drawn from the faculty governance system. They have generally worked well. That is not to say that they are perfect, certainly. Like any human institution, they are always a work in progress. I will come back a little later to faculty governance in the university. I have talked about integrity. What about independence? Earlier, I mentioned the historic origins of the university. A true university is an independent, self-regulating institution. This is what differentiated the early European universities from important precursors such as the schools that cathedrals ran to train future members of the clergy. The modern American university takes a variety of institutional forms. But what these diverse institutions hold in common is a collective commitment to the freedom of expression, which is an essential precondition for the advancement of knowledge and for education. Teachers and students alike must be free to advance unpopular beliefs and to explore unfashionable hypotheses. This is a responsibility the whole community shares. But university leaders play a special role. My responsibility as President of MIT is to help to create an environment here where difficult and controversial ideas can be aired. This must be a safe place for all who teach and learn to explore uncharted, and sometimes difficult, terrain. MIT has effective, longstanding policies to ensure that our campus remains intellectually open. We are committed to this fundamental principle. Academic integrity and independence are necessary if the university is to meet its responsibilities. But they are not enough. Engagement with the world is equally fundamental. The common popular image of the university is summed up in the phrase “the ivory tower.” But that image certainly does not fit MIT today. And in fact it never has. Our tradition of engagement with the world goes back to our founding almost 150 years ago. When William Barton Rogers established the Institute, science had little impact on American college curricula. 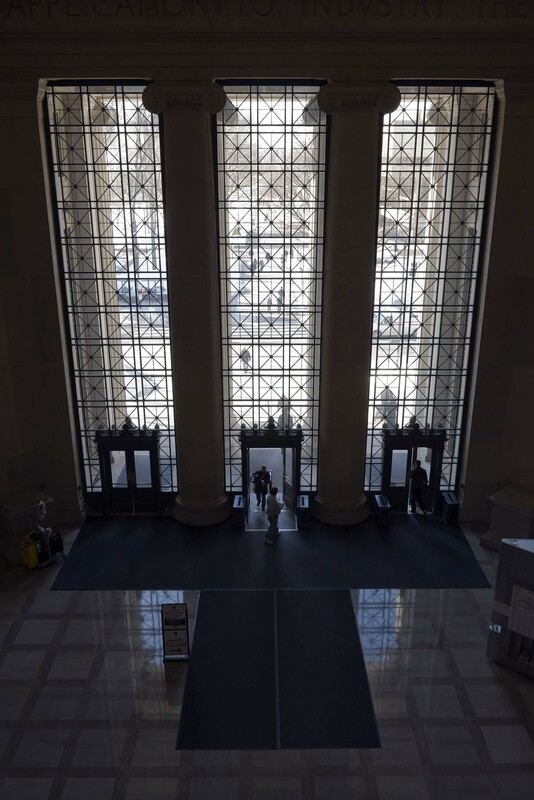 Rogers’ own goals for MIT are summed up on the frieze underneath the dome in Lobby 7: “Established for the advancement and development of science and its application to industry, the arts, agriculture, and commerce.” Since then, MIT has held true to this central vision. In this respect we have truly been an example, and other institutions increasingly try to duplicate a model that comes naturally to us. Our model brings MIT into constant conversation with the world around us, sharing the fruits of our research and education with the world. One example of this model is MIT OpenCourseWare, which puts MIT course material on the web for those around the world to access free of charge. The success of this experiment in democratizing education has been astounding. Launched only two years ago, the OCW site gets more than 20,000 unique visitors each day, and hundreds of messages from teachers, students, and independent learners around the globe, thanking us for our generosity in sharing our intellectual riches. I was personally drawn to MIT because of its impact, which emerges out of its powerful mission of service to the nation and world. Our impact and deeply held mission are unquestionably distinctive. In fact, they are arguably unique. It is through our mission of service that MIT meets its fundamental responsibilities as a university. Think, for example, of our role in advancing knowledge. We work along the entire continuum, from basic, curiosity-driven research to the most advanced applications. We undertake basic research into the fundamental questions of the natural and human world. This research is a passionate journey of exploration and discovery, although it can also prove to have tremendous long-term implications. (A superb example is the work for which Professor Richard R. Schrock won this year’s Nobel Prize in Chemistry, which he undertook with no idea that his discoveries would lead to industrial processes that are more efficient and less toxic to the environment.) At the same time, the Institute fosters advanced applications with transformative powers. Work at MIT generates new knowledge. It generates new jobs and new industries. And it improves health and the quality of life in this country and around the world. Now, there is no question that this is hard work. MIT faculty and students work extraordinarily hard. When people ask me about the intensity of the MIT environment, I frequently reply that inventing the future, and preparing our students to invent the future, is hard work This hard work is not for everyone, but for those who really want to make a difference, MIT provides a uniquely rich – and necessarily demanding – environment. But there is also no question that the hard work is worth it. First, it is an opportunity to do what we love. I find that even MIT’s greatest and most celebrated scientists and engineers are awed and humbled by the mysteries of nature and by the challenge of putting the revealed mysteries to work productively. The chance to do work you love generates profound commitment. And the hard work also offers an opportunity to make a difference. Again, here is a source of profound personal satisfaction. Students here pursue much more than a degree; faculty and staff view their contributions as far more than a job. At MIT we are constantly conscious of the applications and implications of our work. In short, we have a tremendous – and tremendously productive – paradox. Doing what you love to do can serve the world in critical ways. It is all too easy to take what we do here for granted. In some ways that is understandable. To come back to something I said before: Our collective endeavor is always a work in progress. And our commitment to raising the bar for ourselves means we are all too aware when we fall short. We have some very tough examples to live up to here. And the closer we get to our goals, the farther away they can seem. But I still speak as a relative newcomer to this community. And I assure you that what I see is that MIT is an extraordinary institution, and that what is done here can reshape the world for the better. We do this in many ways. For the remainder of my time this afternoon, I will focus on three key ways we meet our responsibilities and transform the world. I could talk about others. But these three are key: Education, innovation, and the power of example. Let me start with education. I said earlier that our responsibility is to educate global leaders. What does that mean? Our core responsibility is to provide the finest possible education in the fields most important to the nation and world. This is critical. We live in an era increasingly defined by science and technology, and MIT graduates are better equipped than any others to answer its challenges. Quite simply, the world needs our students. This education cannot be narrow. We must impart a broad understanding of the context in which science and technology operate. We must foster a collaborative, interdisciplinary perspective. And, in this global age, we must provide our students the opportunity to gain a global perspective. So we must work hard to keep an MIT education relevant. We have a tradition of reviewing the undergraduate curriculum more or less once a generation. I think all of us in the community are looking forward eagerly to the report of the Task Force on the Undergraduate Educational Commons. MIT also has a well-established tradition of inventing, and reinventing, disciplines. This was first explained to me as MIT’s responsibility to the world, and one that is taken very seriously. Many of our departments and schools are now in the midst of a reexamination of their curricula and their teaching styles. The Task Force on the Undergraduate Educational Commons has unquestionably stimulated the natural drive to reimagine how to integrate changing disciplines into changes in education. MIT has another extraordinary advantage in this ongoing process of self-examination and self-renewal in our Visiting Committee structure, which brings every program under review by outside experts once every two years. MIT has a long history of setting educational agendas, probably best exemplified by the work of the Committee on Educational Survey – better known as the Lewis Committee – after World War II. I believe that we have an opportunity, and a responsibility, to set a new educational standard for this generation as well. Beyond specific subject matter, there are additional demands for the education of tomorrow’s global leaders. To my mind, a key quality of any leader is integrity, because without integrity there cannot be trust, and without trust there exists no framework for receiving or conveying understanding. So, the lessons taught explicitly and implicitly here must convey the importance of integrity. Meeting our educational responsibility requires openness as well as relevance. We must be open to the full spectrum of those who have the talents and drive to succeed here. That is why at the undergraduate level we hold firm to our longstanding commitments to need-blind admissions, need-based aid, and meeting the full need of all admitted students. These practices mean that we review candidates for admission without any consideration of their ability to afford an MIT education. They also mean that each student’s financial need is met. As difficult as it is to gain admission to MIT, a greater proportion of our students receives need-based financial aid than at any of our peers – a great deal more than at most of our peer institutions. These admissions principles are seemingly simple propositions, but they are increasingly challenged across the whole spectrum of American higher education. Holding to these principles is essential to our best serving the nation and the world. We must also remain open to students and scholars from around the world, because the advancement of knowledge depends on the participation of the brightest and most creative individuals, wherever they are from. MIT itself has benefited enormously from international students and scholars. We can demonstrate this in many ways. I will note just one manifestation: More than half of the department heads and lab directors in our School of Engineering – widely agreed to be finest in world – were born outside the United States. The second way we must discharge our responsibilities is through a continuing commitment to innovation. Because of the enlightened federal policies of funding basic research in research universities – policies advocated by MIT’s Vannevar Bush after World War II – the American research university has become one of the major sources of discoveries leading to technological innovation. Again, it is easy to take for granted what we do here, but we need to remember that MIT is a tremendous engine of economic growth for the region, the nation, and indeed the world. As many of you doubtless know, Professor Robert Solow, one of MIT’s Nobel Laureates in economics, estimated that more than 50 percent of America’s economic growth since World War II has derived directly from technological innovation. MIT and its people have played a remarkable role in that American success story, with a tremendous string of inventions that have transformed our lives. What is even more important than the past is that the process continues today. Last year, MIT received 133 new US patents, and our Technology Licensing Office completed over 120 new license agreements, 20 of which went to new companies. Today, we have great opportunities to advance the economy and answer human needs. One crucial area, obviously, is human health, as we bring together our historic strength in engineering and our newer strengths in biology and in the brain and cognitive sciences. The prospects are equally exciting in energy. This, of course, is one of the great challenges facing the world today. We are already doing great things in energy and the environment – work like that of Professors Emanuel Sachs on photovoltaics, Daniel G. Nocera on photosynthesis, and Penny Chisholm on the ocean ecosystem. The Energy Research Council, chaired by Professors Ernest J. Moniz and Robert C. Armstrong, is working to establish how we can best build on our unique platform to develop the sustainable energy sources and sound energy policies the world needs now. Finally, along with education and innovation, the third way we must discharge our responsibilities is through the power of example. MIT plays a unique role in higher education in America and around the world. This is not always easy for us to grasp here in Cambridge, because the power of the MIT name grows with distance. It is up to us to use our bully pulpit to advance the causes we believe in. First, openness. I have already talked about the importance of remaining open to international students and scholars. It is vital that we make our voice heard in Washington on this issue. I assure you that our MIT colleagues and I will continue to advocate for openness to all who have talents and drive to make the best use of MIT’s resources – for the good of the nation and the world. We also need to explain the importance of higher education and research. This means educating the public, and our public officials, about what we do here at MIT. It is our responsibility to be seen as a place where core values are upheld, where excellence is pursued with a passionate intensity, where the work of our research translates into benefits for the world. As a corollary, we must stand firm in support of merit review of proposals for federally funded research. The increasingly pervasive practice of earmarking has the potential to distort national investments in science and technology, and to turn universities into just another special-interest group. Institutionally and personally, we have a responsibility to help young people understand the beauty, the joy, and the promise of science and technology. That is why I said, in my first speech to the MIT community, that I wanted MIT to be the dream of every child who wants to make the world a better place. Inspiration, then, is a task for all of us. But with the responsibility of inspiration comes the duty to analyze and understand, and here too we must be an example. An occasion such as this annual Miller Lecture in Science and Ethics is important for precisely this reason, because it can bring the community together to reflect on fundamental issues. But it is also essential to embed critical reflection into the ongoing curriculum and research of the university. Here, the Program in Science, Technology, and Society plays a vital role for MIT. As a preeminent institution of science and technology, we have a particular responsibility to assess and communicate the impact of innovation on society. A final thought on this point: To serve successfully as an example, MIT must meet the highest standards of ethics and integrity. I touched earlier on some difficult recent issues involving allegations of research misconduct. As an institution, we must – and do – treat such questions with utmost seriousness. They lie at heart of faculty governance. Let me speak directly to the responsibilities of faculty governance, and to the particular importance of this principle today. The university uniquely enjoys – and depends on – a horizontal organization of faculty governance. Everything we do rests on the faculty; a university is as strong or as weak as its faculty. But it also rests on faculty governance, on their self-association into departments, labs and other groups, and on the structures of internal governance. MIT can only be a great institution of education and research if our faculty dedicate themselves to carrying out our mission with the highest standards imaginable. The faculty delegates some authority to faculty leaders, in their department heads, faculty officers, deans, provosts and president, but we (the appointed faculty leaders) always remain inextricably part of the faculty. Any description of academic leadership in contest with the faculty represents a false dichotomy. MIT has been particularly articulate in this area, and it is no surprise that a large number of studies conducted by MIT faculty committees – rigorous self-examinations – have had national impact. Time and again, our extraordinary faculty has upheld the highest standards of university governance. The shared responsibility of university governance that relies so intrinsically on faculty governance is of particular importance today. We live in an age of intense concern – warranted, unfortunately – about the appropriate discharge of responsibility. Almost daily the news presents us with examples of departures from standards of integrity in business and in government that we find deeply disturbing. The university holds a position of privilege, enjoying self-governance to a very great degree. We must not default on the trust on which this self-governance is based. Academic freedom is a relatively modern invention. And it can only be upheld if the pillars of integrity, trust, and excellence remain strong. We face a national crisis in responsibility and governance; MIT, with other universities, must provide an example that values-based institutions, self-governed by processes that are perpetually re-examined and renewed, remain viable in this modern age. I have found MIT to be a place of remarkable ethics and integrity, and I am committed to maintaining that tradition. Ultimately, the responsibility of the university is to serve. MIT, by its nature, is an outward-looking institution. Our mission calls us to make the world a better place, through education, innovation, and power of example. This is what MIT has done with extraordinary success for nearly a century and a half. I believe that, working together, we will continue to do so.